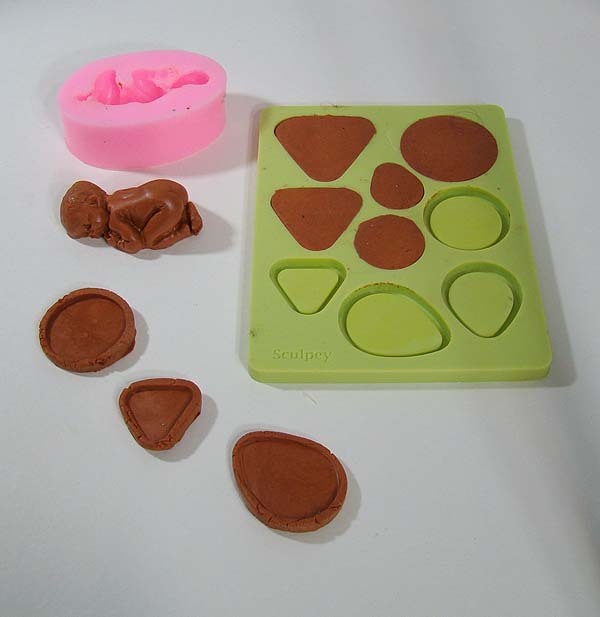 Milliput is kind of a cross between polymer clay and an epoxy putty. It comes with two sticks of clay/putty that you kneed together for about five minutes. When you have one solid color, you are ready to sculpt or mold the material for a wide variety of possible uses. Milliput first came to my attention about a year ago, but it wasn’t until recently that I had the time to try it out. The test run I did could have been affected by the age of the product, and I would like to do another run with fresher product. I was looking for something self-setting that I could use in a silicone mold. 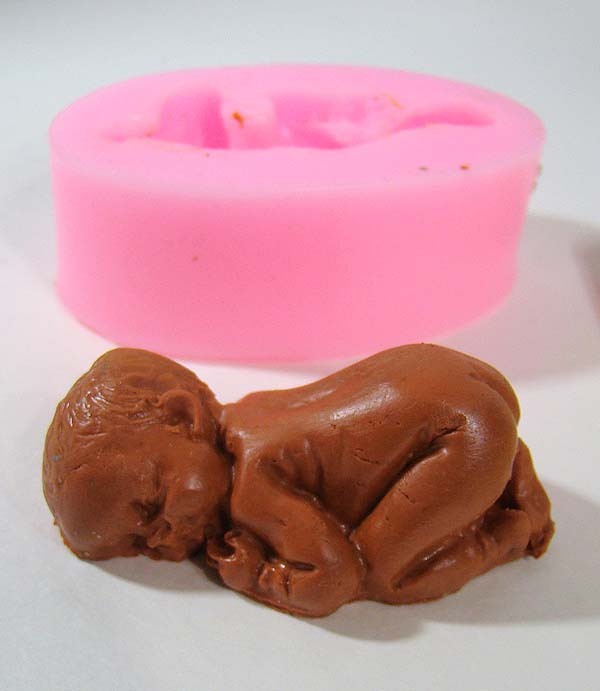 I have a “baby” mold that I have tried to use with resin and plasterite to various degrees of failure. I was hoping for better reproduction and less air bubbles. Milliput definitely passed with flying colors on the baby mold, and with some flower molds I tried. There were a few small cracks but I was able to smooth them out. You can use water for smoothing Milliput while it is still flexible. Milliput failed in the green bezel mold though (or perhaps I did). The edges of the moldings were crumbly, and even though I mashed them hard into it, there were some gaps (I have never been able to get a “perfect” result out of that green bezel mold no matter what medium I have tried). I would definitely recommend trying Milliput for smaller complex resin pieces that tend to trap bubbles, or polymer pieces that are difficult to unmold. I wouldn’t recommend using it with a flexible latex mold, it needs a good solid surface to be mashed into. This baby mold is exactly the task it is well suited to. It’s also ideal for repairing other small sculptures, in-home repairs, and plumbing, among other possible uses. I found it very easy to kneed Milliput, and overall find the product superior to polymer clays in almost every way. 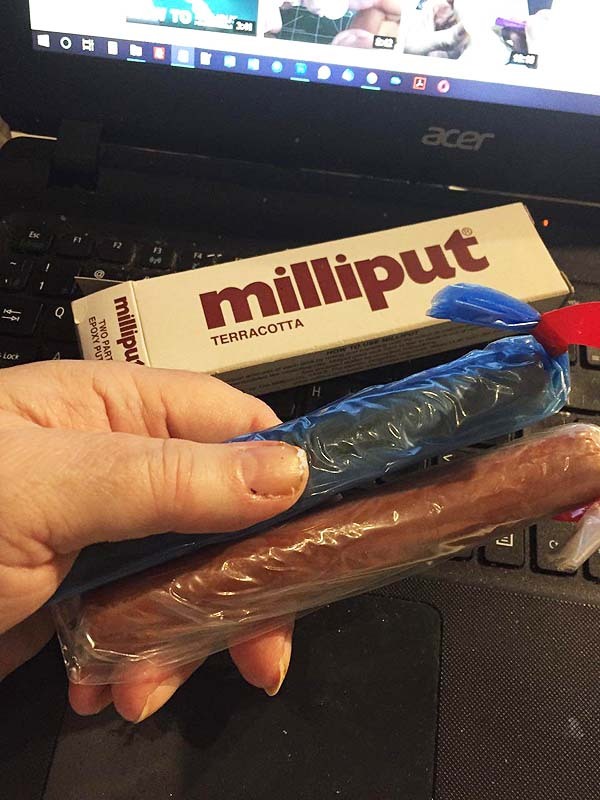 I recommend purchasing Milliput via eBay as it is not commonly available at the bigger craft stores. Milliput only comes in a handful of colors but it takes paint well. It can be sanded or carved if needed. It only takes 3 hours to cure and you get a rock-hard molding. One possible downside is cost. Prices vary depending on color and retailer, from equivalent to Sculpey to as much as twice the cost. But the price may be worth it in terms of strength and ease of use.